New clients of ours, both professors at the Kellogg School of Management are currently living in a high-rise condo in downtown Chicago were looking to establish a home closer to work, preferably within walking distance to work and school for their 2 year old child. Being urban dwellers, and a bit uncertain about what a suburban lifestyle looked like, they were hoping for a location that had easy access to the city and had many of the conveniences that they enjoyed living in Chicago. They wanted either to build a new house or to significantly add to an older home in order to commission a unique contemporary home. They started looking for property in Evanston, where they work and were able to find a vacant lot steps from the university campus and an older house in an established neighborhood, but a significant distance from campus and not within walking distance. Both properties were rectangular in shape and on streets with traditional homes within well established neighborhoods. Evanston has a vibrant downtown, was located on the lake and has strong transportation ties to the city with both an extension of the Chicago Transit Authority train line and a link to the Metra commuter line. Just north of Evanston is the Village of Wilmette which is also an older, inner ring suburb north of Chicago with beautiful homes, the highest ranked public high school in the state, a smaller but still vibrant town center and a fixed rail train link to Chicago. A much smaller community, about 1/3 the size of Evanston, but still with many of the advantages they were seeking. They had found a vacant property that had been languishing on the market for many months. It is considered a large size, 15,000 square feet, is on a quiet street at the end of a cul-de-sac, and is next to the fairway of a golf course that is lined with trees which screen the property. The downsides are that the shape of the lot, which is triangular and it is within eye-shot of the back of a 3 story school. It seemed to me that there were advantages to what many may perceive as negatives. Responses to limitations are can lead to great design solutions and we saw the shape of the lot as an advantage in this regard. The lot was big enough to fit the size house that the client wanted, so it was just a matter of integrating the design of the house to fit the shape of the land, to subdivide it in ways that weave indoor spaces with outdoor spaces. We wanted the house to address the street in a formal way, but not necessarily reveal what was happening beyond the approach. Distribution of outdoor space was not treated simply as front and back, but a way to distribute the interior spaces within the landscape. Circulation through the house is treated as a procession through a variety of spaces with different orientations and views into courtyards varied in function and repose. We are just getting started, finishing up the permit drawings and the harrowing pricing process. We are going to be doing this one design build with NDC's Design+Build entity partnering with KellyISmith Construction. We are very excited to get started. Stay tuned, more to come soon. Online website Chicago Architects has named NDC and our Design Build entity NCA Build as one of the top 10 Design Build firms in Chicago.This is the second top 10 design build list we have been named in within the past 6 months and we are thrilled about the recognition we have received for this business model. Primarily, we are excited to have the opportunity to design award winning architecture as well as being the General Contractor to ensure the our projects are built to the exacting standards by which they are designed. Our involvement as both architect and builder ensures the highest quality results. Although we still work on some projects as just the architect, we are finding that the majority of our clients are now choosing to have us work as Design-Builders. NDC Ranked as Top Design Build Firm in Chicago, but why Design Build? We are pleased to report that NCA Build Ltd., the Design-Build entity of Nicholas Design Collaborative was ranked as the top Design-Build firm in Chicago by Buildzoom Magazine in this article published this month. But what is Design Build, and why would a client want to build their home employing this construction delivery method? Traditional delivery is when the property owner hires the architect to design the project under one contract and a general contractor to build that design under another, separate contract. Contractually, under AIA form contracts, the architect acts as the Owner's agent during the course of construction, making sure the building is being constructed as designed. The architect designs and details the drawings and the contractor builds the building, but the contractor may have different ideas on what they want to build and how they want to build it. This means that the architect must ensure that the GC build the project the way it was designed which can lead to conflict. Some contractors are architect friendly, others don't want to be told what to do, especially from a "know it all" architect. The latter typically leads to architect and GC working against, not with each other. Most clients I encounter these days want to "bid out" the drawings we produce in order to build their houses. This means getting a collection of 4-6 GC's to go through the process of bidding out to their subcontractors, highly detailed drawings for a nuanced, one of a kind home. Generally GC's are given 4-6 weeks to complete this task. Its a lot of work, and it takes a lot of time. Because of this, and without the guarantee of being awarded a contract, many GC's do not want to participate, which usually, eliminates most of the competing GC's. In the currently overheated construction climate, if an owner wants traditional delivery, I would rather that they find a GC with a good reputation and engage that contractor in negotiated bid than putting the project out for bid because there is a commitment to that builder, who knows he/she will be getting the job and that their efforts will not be potentially futile. Design-Build is a streamlined process that has become increasingly popular in large commercial, municipal and institutional projects as well as residential. It saves time and money because the design and construction team are assembled early and utilize their collective knowledge to work together with the Owner and get the project to construction efficiently. Architect and contractor are under contract with each other (one of which is the project leader) and the Owner signs a contract for construction with the design-build team. 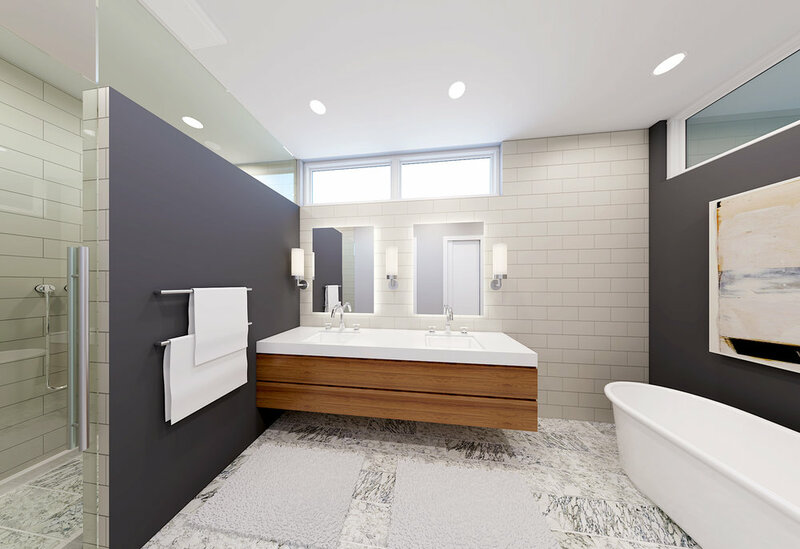 Because the pricing process begins early in the course of the design process, contractor and architect work together for several months prior to construction in order to determine the budget and details for the project. This helps to give the Owner a good idea of the budget early in the process and avoiding "value engineering". By the time the drawings are complete and the permit approved, the Owner will have a clear idea of what the budget will be. Any design changes and budget decision necessary will have already been done and a last minute budget crisis avoided. Because the contractor and architect are under a single design-build entity, the Owner has one point of contact, and because the contractor and architect have a common interest, cooperation instead of conflict between the parties results. Design build, either designer or contractor led, is essentially putting the responsibility of the entire project with one entity that handles the entire project from the beginning of design until the end of construction. Some people call it "turn-key". The owner signs one contract with the Design Build Entity and if something isn't right about the project, that entity must resolve it to the Owner's satisfaction. With contractor led design-build, the GC is in charge and will hire an architect as a subcontractor. Although not necessarily in all cases, my experience with single family residential projects, as an architect hired by the contractor, price can be the sole determining factor. The architect is often treated as a commodity, and our services are limited to producing enough to get a permit and nothing more. This gives the contractor the ability to build it however he/she sees fit without any architect oversight during the course of construction. The contractor will pick finishes with the owner during the construction process. In most cases, the contractor does not have any design training. At NDC+, we produce one of a kind, high quality, durable homes. Clients hire us because of our ability to execute our buildings the way they were designed. With Designer Led Design-Build, design execution and quality are paramount. Because we have the construction team in place early, bidding starts early in the design process and continues until the construction starts, and during the course of construction. During that bidding process, competition is created by bidding out to multiple subcontractors, sometimes 3 or more per trade. There are exceptions to this, such as when a GC is self-performing some of the trades or the subcontractor selected is someone with a long track record of quality and value with architect or contractor. When building a custom house , getting details precise and correct is the difference between a "builder quality" house and a "custom" house. It is even more important when building a modern house because there is not trim to hide errors. Everything is exposed, lines are often continuous and long and if something isn't straight, it is very obvious. With designer led design build, the architect is embedded as part of the design team and will be on site daily in order to make sure that the details are being executed as drawn. Responsibility is shared between architect and contractor. At NDC/NCA Build, we handle the relationship with the client, pick and order finishes, and handle construction administration including payout requests, change orders and schedule management. The contractor is relieved of those responsibilities and left to focus on managing subcontractors and building the project. We are able to select contractors that we have had a long relationship with, who we know can produce the quality that we expect. They in turn understand what we expect and are not surprised with that expectation. They understand our details from past projects, which streamlines our drawing process. We draw less because they know more, which results in savings for the owner. In summary, the contractors are able to focus on building, while the architect is most deeply involved in the design from start to finish. We have had great success in producing superior results when delivering project using the design-build delivery method and we have many clients that will attest to these positive outcomes. Award winning design deserves award winning construction and we have been recognized to have the ability to do both. 5250 Brown Ave. in Skokie, Illinois is a 4,800 square foot (plus a 2,700 sf built out basement) single family house built in 2009 for some good friends. The house is about to go on the market for $1.45 million. It has 5 generously sized bedrooms and 5 1/2 baths, with 2 master suites, one on each of the first and second floors. The exterior is built of stone, stucco and some stained cedar with copper gutters and a slate roof. The interior has wide plank walnut flooring and large format (2'x 4') porcelain with radiant heat underneath it in the heavily trafficked kitchen, family room and mudroom. Kitchen cabinets were fabricated in Europe and the rest of the cabinetry and wood paneling was custom built by craftsmen in Chicago. I could go on, but you get the idea. This is a 100% custom house, impeccably designed with high quality finishes, designed and built by my firm. The landscape has matured beautifully and the house fits the site like a glove, with spaces oriented towards Lorel Park, the local neighborhood park. It has been meticulously and lovingly maintained, like new. All that being said, they will not be getting close to what they should be getting for it. The house was built in a lovely, but lower valued area. Due to appraisal standards, evaluation of comparative property values can only be determined by sales that have occurred on public record. What this means is that if a custom house is built in the area, and the Owner's stay in the house for a period of time, it doesn't exist to the appraiser until it is sold. The seller of a custom house does not get the benefit of considering other custom houses in the area as "comps", thus lowering the appraised value of the sellers custom house. My friends, who knew that they were building above the value in the neighborhood, expected to be leaving the house "feet first", so it was more of a lifestyle decision that an economic one. Plans change, so the economic concern has become more relevant. Fortunately, they are sanguine about their position and although a little melancholy about leaving this wonderful house where they raised their children, but they are ready to sell. The house is listed by Earl Ruthman and Mark Ahmad of Century 21 Affliated. This same house in other, more valuable North Shore Communities or some Chicago neighborhoods would sell for over $3 million. Having raised my own children in Skokie, I can tell you that it is a wonderful community with high quality public schools, unequaled public services, an award winning park district and a diverse demographic. Single Family or Multi-Family in Edgewater? Other projects by Nicholas Design Collaborative in and around Chicago take full advantage of outdoor space whenever possible. Having been in the architecture and building business for over 30 years, it is nice to have a portfolio of work that draws customers to the style of work that I prefer to do. More and more, clients are discovering our work through online searches. The clients for the featured custom single family house we are calling "Mystery Project 03" came to us from an online search. The house is now under construction. There are several reasons why we are guarding the location of the project, but we will reveal more details about it as it progresses. My clients are a young family who were living for a time in my native California who came to Chicago to take advantage of a professional opportunity. They recognized the modernist architecture that we are producing, and the similarity what has been designed in Southern California for over a century. We have been blessed to have people with good taste and a property that is larger than the standard 25' x 125 lot in Chicago. As in all of our projects, we have done our best at bringing in an abundance of natural light and the warmth of the sun, while at the same time, protecting the privacy of the occupants. Our intent to create a house that fits its surroundings in terms of its scale, material and repose. Our manner of design is different than that of the neighboring buildings but we are respectful to the history of the neighborhood. The neighborhood is which it sits, and most neighborhoods in Chicago are eclectic and we feel that the of this house is our expression of the diversity of the neighborhood and the continuum of that diversity moving forward. The house will be light filled but private, spacious with a hierarchy of scale and a sense of procession as one moves through the spaces. It will weaving interior spaces with outdoor spaces. It is designed is modern spatially but there will be a warmth and comfort to the spaces that are created. We look forward to reporting on the construction as it progresses. 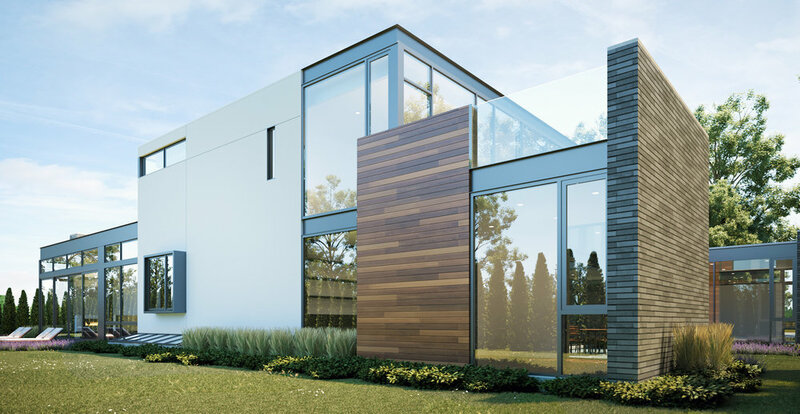 The website for Highland Park Modern, our 4 house single family courtyard enclave designed and developed by Peter Nicholas of NDC is up and running with all relevant information including pricing, floor plans, images, descriptions and specification. Homes are comfortable, Interest has been high since we announced sales 2 weeks ago, and there are only 4 units available. NICHOLAS DESIGN COLLABORATIVE has won “Best Of Design” on Houzz®, the leading platform for home remodeling and design. The 29 year old Architectural Design and Construction Company led by Peter Nicholas was chosen by the more than 40 million monthly unique users that comprise the Houzz community from among more than one million active home building, remodeling and design industry professionals. The Best Of Houzz is awarded annually in three categories: Design, Customer Service and Photography. Design award winners’ work was the most popular among the more than 40 million monthly users on Houzz. Within the shifting and sometime unpredictable business of real estate development, we sometimes have what seems to be a well thought out beautifully conceived idea and we are convinced that people will fall in love because they cannot resisting envisioning themselves living there. This is what we had hoped for our Case Study Houses 2111 project, a four house single family enclave near the heart of downtown Highland Park. The design won a 2015 Association for Licensed Architects (ALA) Design Award in the unbuilt category and we were excited to see it built. It takes a lot more than a design award to get people to invest in a new single family home. When we started the process, the economy and home sales were emerging from the great recession and seemed ripe for this kind of project. The construction industry has recovered to pre-recession levels, however, the work force has far less people to meet the increased demand. Due to this increase in demand, I have found that over the past two years, the cost of construction has gone up, in many cases, 33-50%. As a result, we have decided to redesign the project to a smaller unit size and to a more affordable price point. So here we are, but we are not done yet! We still love the location and we love the new product even more than the original, but this time with more private and usable outdoor space, huge south facing floor to ceiling glass and best of all, for less money. Meet HP Modern. Our initial thought was that our market would be empty nesters from Highland Park and other communities in the North Shore and young families that may be looking for a more contemporary house in a suburban location with excellent public schools,convenient transportation to Chicago and goods & services within walking distance. We still believe in our market and our pricing is significantly less than before. The new design is still true to the work of the great Southern California modernists from the mid 20th century, but with a more compact plan and consolidated private outdoor space. The quality of the construction and architectural design remains the same, but in a smaller package. 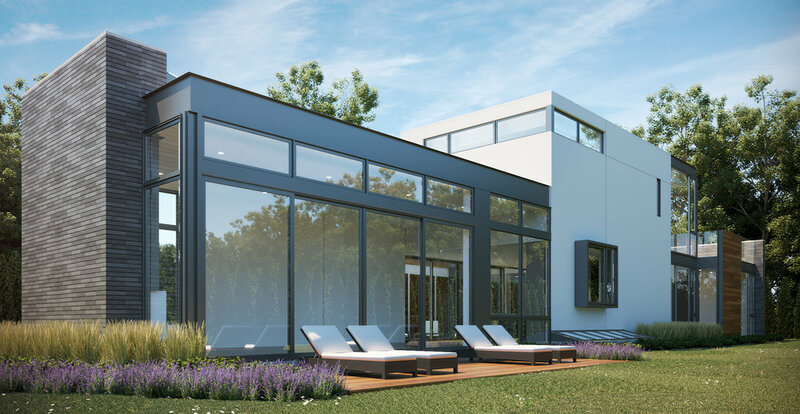 The indoor-outdoor living spaces are even better and more private and we have re-positioned the spaces in such a way that all units have tremendous access to south light and complete privacy from the other houses on site as well as the neighboring structures. We are committed to accommodating empty-nesters and the aging in place by placing the master bedroom and laundry on the main level with easy access to exterior spaces and the possibility of full accessibility for the disabled to the master bedroom and bathroom, kitchen and living spaces. On the first floor, all clearances meet ADA convertibility requirements and can easily be made fully accessible if the need arises. These houses are 4,100 square feet including a built out basement and have 4 bedrooms and 3 1/2 baths. The second floor contains 2 generous bedrooms and a shared bath. The basement has an expansive recreation room with plumbing roughed in a full bathroom, a bedroom, large storage space and a location for a wet bar if the buyer chooses to do so. There will also be 4 guest parking spaces on site. First floor living and master bedroom spaces have floor to ceiling glass and face onto a 1,200 square foot private courtyard garden which includes a raised outdoor living/dining space at the same level of the interior spaces on the main level. In addition, there is a second floor roof deck with a beautiful steel stair down to the first floor patio as well as a direct connection from the second floor. Pre-Construction Sales Start on February 22nd! Expertise.com selected NDC from a list of 293 Chicago Architects as one of the Top 20 for 2016. To see all the firms selected, click on this link. Here is the criteria they used in their selection. "Our goal is to connect people with the best local experts. To do so, we analyzed and scored architects on more than 25 variables across six categories to give you a hand-picked list of the best architects in Chicago, IL. Actively engaged with their customers across a number of platforms." The Flite Series, The NDC designed 4 unit townhouse development located on the banks of the Illinois River in the Heritage Harbor boating resort in Ottawa, IL has contracted two of the four units offered. The two end units which have 3 bedrooms, 3 1/2 baths including two master suites and a loft space are under contract, leaving the two interior units, one with 2 bedrooms, 3 1/2 baths ($399,000) and the other with 3 bedrooms and 3 1/2 baths ($405,000). Sales have been brisk over the past several weeks at Heritage Harbor. In addition to these units being sold, 3 lots to the west of the Flite Series recently went under contract in the past 2 weeks. If you are familiar with Park Boulevard in San Diego, you no doubt have noticed the iconic Mondrian-esque bar located at 3780 Park Boulevard named THE FLAME. Its hard to miss with its colorful facade and neon sign, but for the past several years it has been vacant while the district surrounding it has developed into a much higher density mix of residential and commercial projects. The once vibrant facade has been painted black with red accents, undoubtedly in an unsuccessful attempt to brand it as "Goth". One project that has not changed is the building to the south of The Flame, the Egyptian Court. My brother Jim Nicholas of Clownfish Properties bought this predominately one story apartment building in the 1980's amidst much controversy as the previous Owner, in an effort to obliterate its architectural significant attempted to jack hammer all of the plaster Egyptian Revival ornament off of the building with the intention of replacing the building with a higher density project. He was stopped as the tenants wouldn't allow it and an uproar erupted in the local community and media. The previous Owner was so maligned that he decided to sell the the project. At this point brother Jim stepped in, and being the steward of good architecture that he is, recast and replaced all the destroyed ornament and brought it back to its original glory. He also replanted the landscaped courtyard with lush plantings consistent with Egyptian Architecture and making the environment complete. He was nominated and won an "Orchid" at the annual design competition, "Orchids and Onions" which judges the best and worst of architecture and public art in San Diego. Needless to say he was celebrated for his efforts. Over the past couple of years he has been talking (obsessing) over The Flame, which sits next door, he could not stop considering what could be done with this property. In actuality, the architecturally significant part of the project is the facade and the neon sign. The rest of the building is a one story, 6,000 sf concrete box. Jim's idea was to keep the bar, which would be reduced from 6,000 sf to 2,000 sf and building up behind the facade and distinctive neon sign in a respectful and complimentary way. The sign would be repaired and brought back to its original state and the facade which although distinctive, had no windows facing the street. The new design would enhance the existing facade by installing roll up "garage doors" with translucent glass to match the existing color of the existing painted wood panels and would open the space to the street during days with good weather. Everything else about it would be faithful to the original design. The residential portion of the project will have 6 apartment units, 4 of which will be two level duplexes. Two of the units will face the street, while the other 4 units will face a private, internal courtyard. After a somewhat arduous entitlement process, the Historic Resources Board unanimously approved the project and we expect it to be submitted for permit in July and with any luck, construction will start before the end of the year. NDC was the Design Architect on the project and is working with local architect Scot Frontis, who will be the executive architect. Something that I find myself thinking while moving around Chicago, especially in new housing products is the lack of variety and diverse use of exterior materials. It is not because of a lack of available products, both newly developed and traditional. I think because whoever is designing these buildings or the developers who are commissioning those designs pick the easiest route, which is not to consider alternatives, but just to do what worked last time and to play it safe.To me, that is just lazy. I have no problem with being contextual in a neighborhood and, for example, putting up a building that is brick, in a neighborhood that is brick, or cladding a building in siding in a neighborhood where the house are predominately clad in the same material. The problem is that often, the new development doesn't go nearly as far in matching the care and detail of the existing neighborhood. How many times have we seen the hulking, scaleless three story plus basement house of 3 flat next to the cowering adjacent bungalows. I understand and actually sympathize with a property owner building to the limit of what zoning allows, however if some thought was put into breaking down the mass into smaller volumes, adding additional planes, adding detail. Stainless steel shingles are a product I discovered on the Walker Library in Minneapolis by VGAA. I liked it immediately for it's residential scale, durability and the natural variety within the color range of the surface. I chose to use it on the front facade of the building as a new wrinkle on a block of eclectic materials. The difference between a "builder" house and a "custom" house is the care in the layout, thoughtful detailing and use of interesting materials that help the building working with the neighborhood scale. On our Edgebox project, located at 5945 N. Magnolia in Chicago, we decided to experiment with a combination of different materials, some traditional, some new. Stucco, stained cedar and stucco can be found on most streets in Chicago, and for good reason. These traditional materials are beautiful and durable, can be locally sourced and are abundant. We have chosen to use these materials not only on Edgebox, but on several other projects. Demolition is complete and we are talking to a couple of interested parties about purchase, but nobody has yet come to the table to purchase. Take advantage of the opportunity to work with our skilled and committed team in making this house your own. The interior is an open book for you to select finishes. 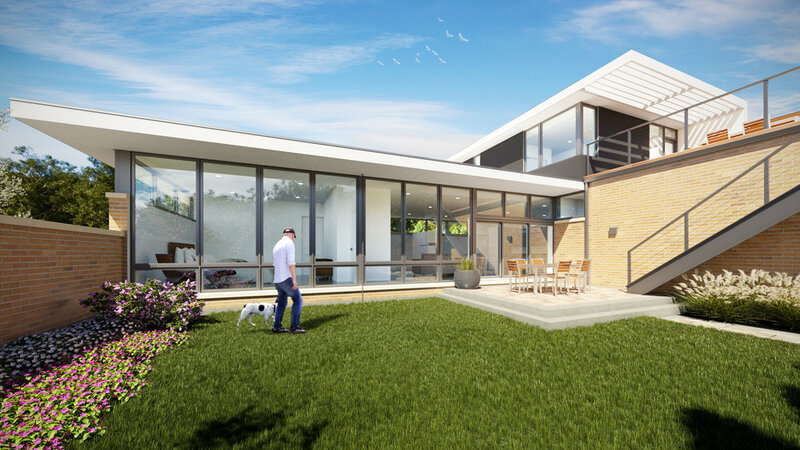 The house is permitted and ready to build as soon as a buyer steps up. We are making progress on the demolition of the dilapidated single family residence that currently exists at 5945 N. Mangolia Avenue in Chicago. Never on a project that I have been involved has the neighborhood been so glad to see an old house go away. When I signed the standard real estate contract for the purchase of an decrepit single family house at 5945 N. Magnolia Ave. in the Edgewater neighborhood of Chicago in January 2015, I would have never guessed that it would have taken 15 months to complete the transaction. But after much effort and the support of the surrounding community, the members of the EPIC block club and the help of Alderman Harry Osterman's office, the deal was consumated and the house will be demolished starting this Friday, April 15th. I am normally not so gleeful about the demolition of an existing structure, but this particular house was beyond repair, infested with animals and filled with literally tons of soaked papers, old furniture and rusted bicycles. The previous Owner finished collecting his salvagable belongings and has gone back to his homestead in rural Southwest Wisconsin. He had not been living on Magnolia street for decades and it has become a environmental and and visual disaster. The emotional attachment to the memories the seller had for the place rendered him unable to complete the deal, but after the mobilization of concerned neighbors by super organizer Lynn Pierce, we were able to move the transaction to completion with the help of a reasonable presiding judge who was able to apply the appropriate amount of legal pressure. I am happy to say that never did my communication with the seller become contentious and the conversation was civil until the end. He walked away with a tidy sum of money for a property that had become a legal and emotional burden, and although I cannot speak for him, I believe that letting go was the best thing for him on several levels. I on the other hand am beyond pleased to have the opportunity to add a new piece to the urban fabric in a neighborhood that is very familiar to me, having completed the renovation and addition to a building just two blocks to the south on the same street, our Periscope House, finished in the summer of 2014.